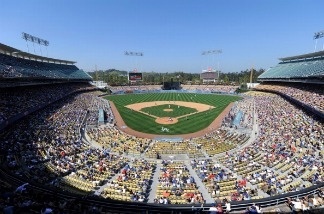 Dodger Stadium on April 17, 2011 in Los Angeles, California. After trudging through Dodgers drama for three long years, a winning bid for the team zipped through in a matter of hours yesterday. Headlines featured Lakers legend Magic Johnson as one of the new would-be owners, but his partner with moneybags for the $2-billion bid is Mark Walter, CEO of a financial services company based in Chicago. Walter met with beleagured Dodgers owners Frank McCourt privately in New York yesterday to reach an agreement on the assets. McCourt will retain some portion of the parking lots surrounding the stadium, but not on game days. Walters and his firm, Guggenheim Partners, will be borrowing some portion of the $2 billion, but will make it back quickly after selling TV rights. A bankruptcy judge must approve the deal, but that's being deemed a formality. Another key member of this bidders group is Stan Kasten, the longtime baseball executive. The former president of the Washington Nationals and Atlanta Braves would run the team with the hopes of revitalizing the organization. What do Angelenos think of this deal? How much vetting should be done of the prospective owners? What will it take for you to return to Dodgers stadium? Mark Lacter, contributor to LA Magazine, writes the business blog for LA Observed.com and talks about business with KPCC's Steve Julian Tuesday mornings. Is today the start of a triumphant new Dodgers era? Will Major League Baseball re-evaluate Magic's Dodgers bid?